Where's Leonard Nimoy when you need him? Animal Planet is going all In Search Of-y on us with a poll that says that more than a third of Americans would like to see Bigfoot proven as real. When asked what legendary creature they would like to see proven as real, 36 percent of people said they would like Bigfoot to be real, while 21 percent said ghosts. Twenty-seven percent said various other creatures, including vampires and werewolves. So what's your favorite on-screen rendition of Bigfoot? Sure, 1977's "Sasquatch, the Legend of Bigfoot" is low-budget cheese. 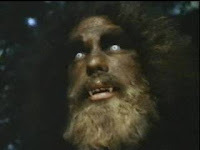 But Andre the Giant as the hairy monster on "The Six Million Dollar Man" beats them all -- to death with their own arms. Raaaaahr! Anybody want a peanut? I watched "Sasquatch, the Legend of Bigfoot" and the equally cheesy/low budget "Search for Noah's Ark" (something like that) at the St. Cloud drive in theater.